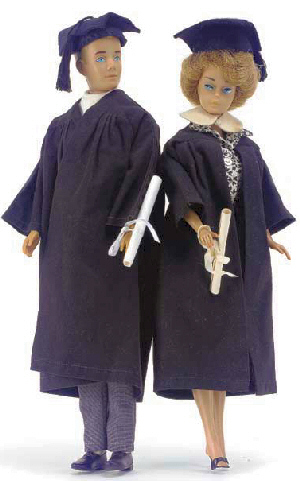 Barbie and Ken's Graduation ensembles are one of the few styles that haven't changed over the years! Barbie's collar is white felt and has a button closure. Both caps have tassels. The diplomas are actually plain paper tied with a white ribbon. The black gowns have gathered yokes and long sleeves. These ensembles are easy to find and are generally very inexpensive. The diplomas and white collar are the hardest pieces to find.